A quick view of the most influential metrics in Metro Honolulu. Honolulu, Hawaii is the largest city in the chain of Hawaiian islands and the capital city of the state. It is also the county seat of the city/county of Honolulu. It is located on the island of O'ahu, has approximately 118 neighborhoods and is a major hub of international business. It is a nautical community with a rich maritime history, beautiful beaches, breathtaking ocean views and a plethora of waterfront activities and entertainment. The city has a tropical, hot, semi-arid climate. It is a major tourist destination known for the diversity of its people, cultures, traditions, and cuisine. It is a well-educated city, over 35% of all adults in Honolulu have four-year degrees or more. It is an extremely diverse city where over 27% of all residents are foreign-born. English remains the primary written and spoken language in the city, followed by Pacific Island Languages and Chinese. Honolulu has many nicknames including Paradise, The Big Pineapple, the Crossroads of the Pacific and others. The city motto is No'O Honolulu, which means "The Pride of Honolulu." It was officially incorporated in 1907 and has been growing ever since. The name Honolulu means sheltered harbor or calm port. It is the westernmost major city in the United States and the most remote major city in the world. Honolulu has 29 sister cities around the globe, including Bombay, India; Kyzyl, Russia; Breyeres, France; Hiroshima, Japan and others. The city spans 68.4 square miles, 69.5 of land and 7.9 of water. It is a wealthy city compared to state economic standards and upper-middle income compared to national standards. Honolulu has a mixed workforce of white, blue and no-collar workers. The local economy is based primarily in tourism, trade efforts and international business. Major companies based in Honolulu include Central Pacific Bank, Hawaiian Electric Industries, Hawaii Pacific Health and many others. Three air companies are based in the city, Hawaiian Airlines, Aloha Air Cargo and Island Air. In 2010, the population was 337,256 and the population density was 5,791 people per square mile. In 2016, the estimated median household income was $69,964 and the estimated per capita income was $37,050. In the same year, the estimated median house or condo value was $761,358 and the mean price on all housing units was $738,655. There is only one public school district for all of Hawaii and it is operated by the Hawaii Department of Education. The school district has 291 schools, Honolulu has the 7th best system in the district. Public transportation is available and bus service is the most popular option for daily commuters. There are many museums and venues for cultural events in the city of Honolulu, including The Bishop Museum, Foster Botanical Garden, Diamond Head Theater and more. Tourist Attractions include but are not limited to, the Honolulu Zoo, Iolani Palace and the USS Arizona Memorial. Homes for sale range from modest to luxurious and from affordable to sprawling mansions and estates. Other real estate options include apartments, townhomes, condominiums, villas and more. 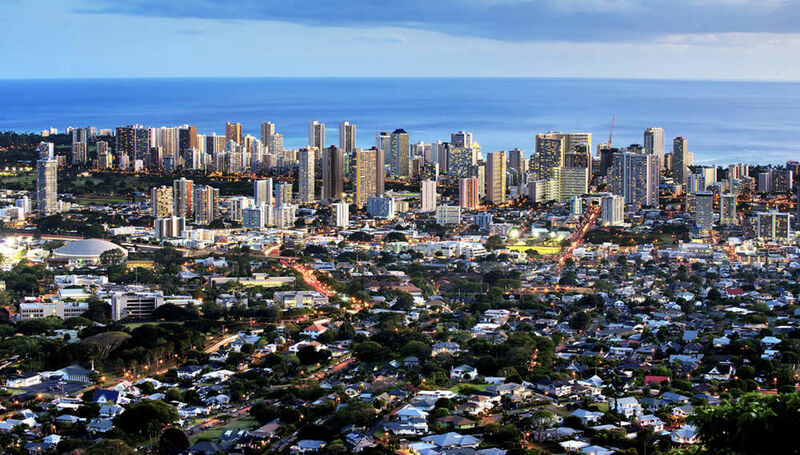 To begin your home search in the beautiful, warm and welcoming city of Honolulu, call local real estate agent and expert Stefanie Cruz and Isabella Holmgren today at 803-348-0697. View our selection of available properties in the Metro Honolulu area. Check out the latest demographic information available for Metro Honolulu. Learn more about schools near Metro Honolulu complete with ratings and contact information. Browse through the top rated businesses in the most popular categories Metro Honolulu has to offer.